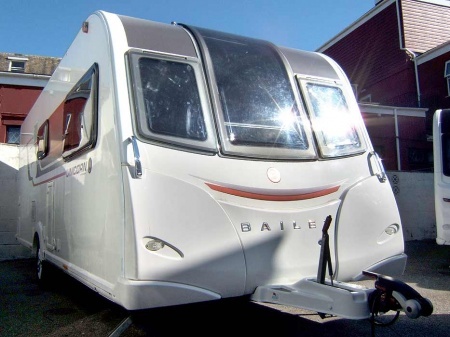 This highly modern, 3 berth Bailey Unicorn caravan is in a lovely condition throughout the caravan. There is no fixed bed, but instead it comes with a dining area for extra convenience at meal times. Due to the front skylight and distribution of rooflights all along the caravan it has a wonderful light, airy feeling, making it an extremely pleasant caravan to be in. Externally the caravan is in very good condition and has some nice features such as an external gas barbeque point and an external mains socket. If you plan to use it with an awning there is a flush fit awning light. We describe the interior in detail below. Seating - each seat measures 1.85 metres before cushions are put in place, giving plenty of seating for four people plus other guests. As you would expect from a 2015 caravan, seating is practical, comfortable and firm. Night-Time Lighting - the lounge has 4 directional spotlights each with their own switch This means that you can select which ones to have on or off. These are set into the 'four corners' of the lounge. In addition to these there are small 'mood' lights that are positioned in front of the overhead lockers and on the ceiling. Daylight - the combination of surrounding windows, distinctive front skylight and the rooflight above, provide lots of daylight into the front lounge giving it a very pleasant and rewarding feel. Storage - The lounge has 4 overhead lockers. In addition to these there are two drawers and a small cupboard in the cabinet between the seats. There is of course storage beneath the seats as well. This can be accessed in two different ways; by using the handy side door ( one seat only ) but these only gives partial access or by removing the seat cushions and lifting the slatted wood frame ( this gives full access ). Using As A Sleeping Area - The front lounge has an Easy Bed Make-Up System. This is an array of wooden slats that pulls out and runs on a glide-track. It makes the process of changing the lounge into a sleeping area easier and less tiresome. To cut out light, all rooflights and windows have integral pleated blinds. 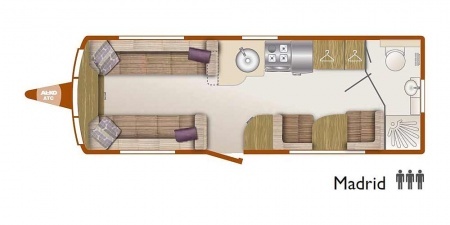 You can either make the area into a double bed; 6' 6" x 6' 2" or two single beds; 1 @ 6' 2" x 2' 2" and 1 @ 6' 4" x 2' 2"
Entertainment - There is a JVC DAB Radio / CD player with a USB connection point. This is connected to two JVC stereo speakers for entertainment and your enjoyment. As well as the main TV station the front lounge also has a TV connection point with 12 volt and mains power sockets - at the very front - located on the front window sill. Daylight - the panoramic window behind the hob and sink plus the rooflight above give balanced daylight into the kitchen area. Night-Time Lighting - there is a small striplight over the hob unit. At either end of the rooflight are some small downlighters and then there is the main ceiling light. Cooking - The kitchen is fitted with a Thetford Caprice combined oven, grill and hob with electronic ignition and flame failure device. There is also Daewoo, stainless steel 800 watt microwave. Hob - A Thetford dual-fuel hob with electric hotplate and 3 gas burners. Refrigerator - The kitchen comes with a Dometic 133 litre, tower refrigerator with electronic ignition. Sink - recessed stainless steel sink with single mixer tap. Central to the caravan, the TV station is directly opposite the Kitchen. It's position means that the television can be viewed from both the front lounge and the dinette area. The station has the usual TV connection point, 12 volt and mains socket power points. These are connected to a signal booster and the aerial. There are also cupboards for storage of DVD's, leads etc or if you preferred these could be utilised for extra kitchen storage. A smart and nicely proportioned washroom. As you enter, immediately on your left is a large cupboard with several shelves. A cupboard behind the toilet and another beneath the washbasin provide even more storage and there is also a long shelf. To the right-hand side of the washbasin is a laundry basket. A wall mounted mirror with a single small spotlight above it can also be found on the left wall. The shower cubicle is a nice size measuring 80cm x 68cm approximately. There is a roof vent to reduce condensation. Daylight comes into the washroom via the window and roof vent. For nightime lighting there is a main ceiling light and a downlighter over the mirror. Chassis - an AL-KO one-piece, galvanised steel chassis. Bodyshell - Bailey's Alutech Bodyshell provides enhanced thermal insulation and minimises the number of potential water access points. Caravans are lighter, providing stability and improved road handling for safer towing. AL-KO ATC Trailer Control System - an anti-snake system that monitors for instability making every journey you take safer and more controlled. Heating - Alde Hydronic Compact 3020 programmable radiator heating system with combined water heating. Alde 3020 boiler. Refrigerator - Dometic 133 litre tower refrigerator with electronic ignition. Cooking - Thetford Caprice combined oven, grill and hob with electronic ignition and flame failure device. Thetford dual-fuel hob with electric hotplate and 3 gas burners. Stainless steel 800 watt Daewoo microwave. Radio / CD Player - JVC DAB radio / CD / MP3 player with USB connection point. Connected to stereo speakers. Cassette Toilet - Swivel Thetford C-260 casette toilet with integrated header tank. Bed Size - Front Double: 6' 6" x 6' 2"
Bed Size - Front N/S Single: 6' 2" x 2' 2"
Bed Size - Front O/S Single: 6' 4" x 2' 2"
Bed Size - N/S Single: 6' 4" x 2' 4"